As you might have noticed, it seems that a great majority of work at home companies require signing up as an independent contractor rather than as an employee. While there are definitely some perks you can enjoy as an independent contractor, many people simply do not like the idea of it and would prefer to work as an employee where taxes would be taken out of pay automatically. Working as an employee for a company also usually means you get paid training and other benefits like insurance and paid time off. If you're not too keen on the idea of being an independent contractor, you might want to browse through this list I made of companies that hire you as an employee. You'll notice that most of these are phone-based jobs. I'm having more difficulty finding home jobs in other fields that don't consider you an IC, but will try to update as I come across them. Keep in mind this is just a general list and not all will be actively hiring right now. Thanks, I will get them added. Does anyone know which of these companies will hire employees from South Africa? 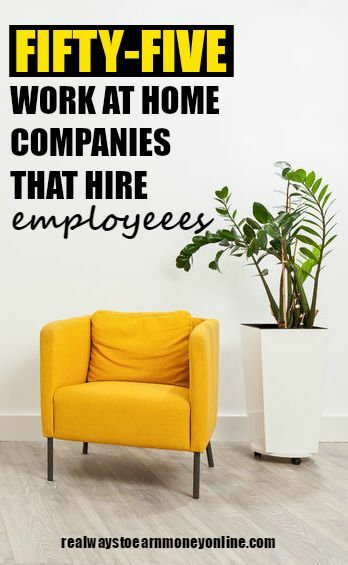 Guthy Renker and West at Home hires you as an employee. Does anyone know which of these may be the easiest to get on with? Or which one’s hire the most frequently? Just skimming through the list, I know that most of the phone-based ones listed are usually open to applicants. The Active Network (top listing) hires seasonally and if I’m not mistaken they aren’t too hard to get in with. The pay is on the low side, but everyone says it’s an easy, stress-free phone job. You’re basically taking reservations for sports and camping events. I work for a division of Xerox and work from home. I originally worked in an office for them, but then moved and was allowed to work from home. I make a great salary and benefits. They pay for my internet, I have a company laptop, scanner, printer, and cell phone. I only stumbled on this page, because my brother runs the Penny Blogger and it was on his site. Hi! Am from Mauritius and i am looking for a work from home, all the site i come across goes on and on with lots of link to follow or even some we have to pay to subscribe. can’t anyone advise on a direct website where i can apply to work from home? I remembered reading this list but couldn’t find it (guess I was using the wrong search terms) I had given up and then saw it shared on Facebook! I want to give this list to Dion from http://homepreneurs.net/ He has been diagnosed with MS and is looking for a work from home job with benefits. He is just a few hours short of getting his masters in Information Technology if you come across anything, please let him/me know. I’ve told him about virtual jobs with benefits: Aetna, Xerox, and United Health Care. Thanks! Great list, thanks for sharing. I’ve been keeping tabs on your site as I need to find a flexible wah job asap!